It’s that time of year of again…where gross food is welcomed by the little boys that inhabit my house. Nothing brings a smile to their face like something bloody, goopy, poopy or oozy when Halloween is in the air. They love it. So put these on your Halloween menu…the kids will love the grossness. I mean, remember the Kitty Litter Cake? Their all-time favorite. Break graham crackers into eight sections. Smear on white frosting of your choice and one drop of red decorator’s gel is enough (it runs). 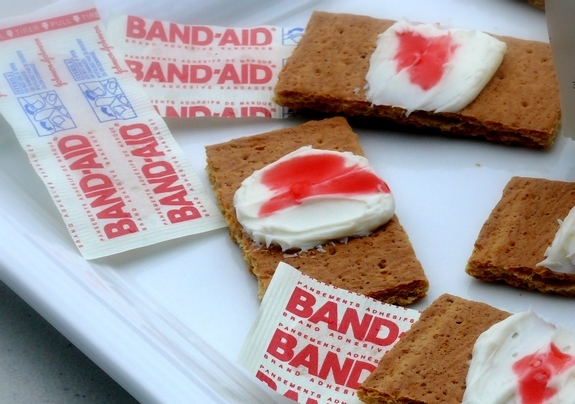 Serve on a plate with real Band-Aids. Smiles and grossed out faces to follow. Here we go again. More scary, bloody looking, unthinkable, Halloweeny treats. You amaze me for being such an avid fan of the season. You bake, you decorate inside and out, and most of all you find ways to enhance your boys appreciation of Halloween. I do remember the kitty litter cake…..that was a big hit nation wide! Just when I think you cannot get ANY more creative! LOVE these! Mmmm these are so weird…any yummy looking. Eeehttp://www…how fun! 🙂 I can see why your boys would love these. I’m going to surprise my children with these after school today- I’m sure they will love them, too! They look great!!! SO glad you made them and your boys liked them! Thanks so much for linking back to me. Good afternoon! 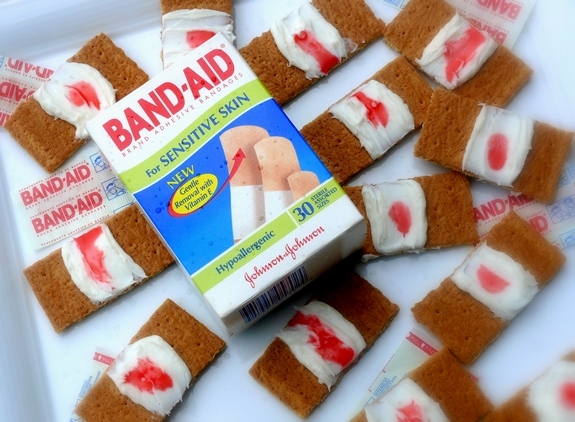 I loved your Bloody Band-aids so much I featured it in a Halloween recipe round-up on my blog. Feel free to paste my button on your post and stop by to check out the other awesome recipes. Thanks so much for sharing your creativity! I think these will be a hit in the lunch box! These freak me out everytime I see them! haha So awesome for a Halloween treat! I’m thinking of using wheat crackers (same rectangle shape) and spread cream cheese with a dab of red pepper jelly to offer at an adult party. Looks cool!